Providing for your family. Funding your well-earned retirement. Leaving a legacy for your loved ones. These are all priorities in life that are important to you. That is why they are also important to us. We truly care about you and your financial well-being. Our close-knit team is dedicated to sharing our knowledge, capabilities and perspectives – bringing together our individual experience, strengths and perspectives to personalizing your financial plan and carefully managing your investments. While David and Martin have more than 37 years of combined experience in the financial services industry, they are still in their prime and plan to continue their careers for many years to come – and to serve you and your family today and for future generations. Many of our clients are or were once entrepreneurs before they retired or sold their companies, so we share their entrepreneurial spirit. After all, many good things happen in small businesses. They employ about half of America’s workforce, incubate new technologies and develop new business methods. The fact is, we simply can’t have a strong economy without successful small businesses. 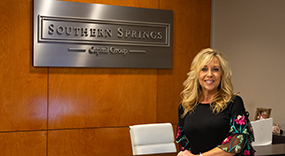 To better serve entrepreneurs and all of our clients, we have called upon our entrepreneurial spirit once again to open our own independent firm, Southern Springs Capital Group. We feel like we can now focus all of our attention on client satisfaction, not on satisfying some corporate parent that increasingly tells us how to serve our clients and what investment products to offer them. Our independence gives us complete freedom to offer objective, unbiased advice without any pressure to put our clients in proprietary investment products. 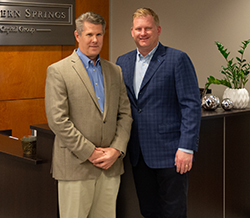 For the brokerage resources and services we need, we chose to affiliate with Raymond James, one of the largest independent financial services firms in America. Raymond James values and honors independence as much as we do – so we couldn’t think of a better fit for us – or for you.